If you are looking for a tool that could help your child learn how to balance, a balance bike could be the perfect one. A balance bike is generally a two-wheeler bike but has no brakes and pedals in it. This works by allowing your child to stand or sit over the saddle of his bike while walking using his own feet as brakes. There is various kind of balance bike available in the market, but all of them are not such a good performer. You have to be tricky when you are choosing one. If you are looking for the best balance bike for toddlers, but bit confused about choosing it, then you are at the right place. No worries about picking the best balance bike in UK! Just follow this article, and you will be able to choose the perfect one! In this article, we have reviewed the top 5 balance bike. The Strider 12 Classic No Pedal Balance Bike is top selling balance bike in UK. Its designed is well thought out to give focus on the fundamentals of balancing, steering and leaning without any complications and distractions from training wheels or pedals. The seats and the handle bars are fully adjustable which makes it easy to fix depending on how big the child is. Also the seat is cushioned and has a safety pad that allows the kid to have a smooth ride and can protect your child when they fall. This bike is great for small kids as it is easy to adjust and not heavy which means that children will not have any problem riding it or sometimes, dragging it around. The Strider classic bike is the lightest among its series. Hence it is easy to use and ride for the toddlers. 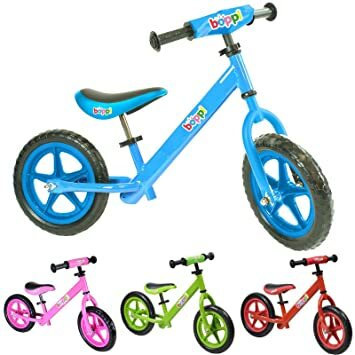 The seat height could be adjusted as your kid grows taller, this toy bike can be used until he or she is 5 years old. No-pedal design helps in bringing up the confidence of your kid as they can focus on balancing. Accessories and upgrade kits allow for a wide range of customization. Foam tires never go flat and are maintenance free. Chicco Bullet balance bike is quite affordable as compared to other budget balance bikes. All without compromise on the quality, durability and overall riding experience the child should expect. While the design of this balance bike is very straightforward and without too many bells and whistles, the color scheme makes it very eye-catching. It is quite a compact little bike, so even with the adjustable seat it is something that children will outgrow faster than some of the other balance bikes on the market. The handle bars on this bike have a rubber grip with flanges on both sides. The area which the child holds has a series of rubber dots and both feels nice to hold and is secure even if it gets wet. The end of the handle bars have four quite large spaced rubber flanges. These act as a very basic shock absorber if the bike and rider falls over. It has foam tyres which can absorb little bumps comfortably. The Chicco Bullet does very well on smooth surfaces and handles slight inclines and declines with no problems. If a hill starts to get steep either up or down it presents a problem either to keep moving or with the lack of brakes to stop. Very comfortable to use and offers a good level of comfort in the seat as well as plenty of control over the handlebars. The seat on the bike is adjustable to fit any child on the bike. This balance bike is the most durable and great for the safety of your kid. FirstBIKE have very high quality frame that is extremely light in weight. This balance bike is certainly a great product and packed with versatile features, comfortable and easy to steer that will help your child to get the best experience. Assembly is simple, you just need to attach the front wheel and the handle bars and you are ready to go. The seat is adjustable in height so this will grow with your child. You have the option of choosing a bike with hand brake or without it. The braking power can be adjusted. The rear drum SafetyStopTM brake ensures a gradual braking. It incorporates mudguards in the front and rear wheels to prevent your kid from dirt and gravel. You also have additional safety features like the turning limiter, and easy knob dial seat post adjuster. Extremely lightweight, flexible and durable materia. SafetyStop brake that provides gentle, gradual breaking and a steering limiter to help child control the bike and prevent falls. Horse saddle shape provides comfort, stability and prevents from slipping off when riding downhill. No sharp edges or protruding screws and sealed bearings to protect little fingers. Different accessories help to get the best function from the bike with different features. This balance bike is made from lightweight steel, with soft handlebars, a padded seat and puncture proof tyres. With this price, it is one of the best balance bike you can buy. It has adjustable seat and handle bar and can be used by kids from 2 to 5 years of age. Height adjustable padded seat and handlebars. Strong, durable EVA foam tyres allow for use both indoors and outdoors and will remain puncture free for the life of the bike. No pedals, no gears and no brakes. The undisputed favourite amongst the girls, the ‘Pastel Dotty’ version of the Kurve from Kiddimotto was the big winner in the style stakes. It is a lovely little balance bike that is not only wooden but also really lightweight, has puncture proof tyres and an adjustable padded seat. This bike is suitable for 2, 3, 4 and up to 5 year old and is suitable for both indoors and out – it’s a great first balance bike. Real pneumatic tyres ensure a safe and comfortable ride. Manufactured from sustainable sourced birch plywood. First, consider what type of balance bike would be best for your child, and to your pocket. There are three options you could choose from: wooden, metal and composite. A wooden balance bike is an eco-friendly bike since it is generally made from marine grade renewable birch wood. Biodegradable lacquers and paints are used to style up the bike. You could select a design that your child might possibly like. 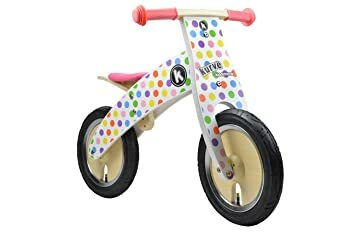 There are wooden balance bikes that are painted with comic pictures, or if you want, you could go for a retro look balance bike. On the other hand, a metal balance bike could be made out of steel and aluminum. 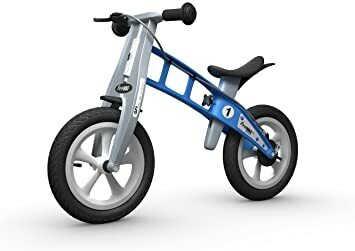 Metal balance bikes look like normal bikes because they have adjustable handle bars, fast-release seat and optional brakes. You could purposely build your child’s metal balance bike. Steel bikes are generally cheaper than aluminum bikes. However, aluminum bikes don’t easily rust compared to steel ones. And lastly, composite balance bikes are considered as the best type. It is the most durable type and the most costly one. Its main advantage is that it could last for a lifetime if given necessary care. It won’t rust and has a high resistance to humidity. You could pass down this bike to another generation of your family. A balance bike could only function well if you got the right seat height for your child. You could ask for assistance when purchasing in order to measure your child’s inseam. But these days, there are balance bikes that are already equipped with adjustable seat heights. Only metal and composite balance bike have optional brakes. Generally, if you have a toddler aged 2, they don’t use brakes, not until they learn how to balance. But as your child grows, they eventually learn how to brake. Choose the balance bike that is appropriate for your child’s age. Among the types of tyres are foam tires and air tires. Foam tires are a wise option since they are light and needs little maintenance. But if they are used in rough terrains, they would eventually wear out. For a more durable option, you could choose air tyres. These types of tyres are generally versatile. A balance bike is a bike sized for toddlers that does not have pedals. It is a great way to teach children the fundamentals of riding a bicycle in a way that truly teaches them balance, steering, and confidence. A young child uses their natural instinct to sit on the child sized seat and push along with their feet, gradually building up speed as they become comfortable. Within a few short weeks the child is lifting up there feet and coasting along on two wheels. Introducing your young child or toddler to a balance bike can eliminate the need for training wheels as he gets older. When teaching your child to ride a bike in the past, first came the tricycle and then a larger two wheel biked with training wheels. However, training wheels do not teach kids balance or proper bicycle steering. Training wheels give a the child a false sense of security and the child often falls when turning corners. And many parents, including myself, have found it hard to wean a child off of the training wheels because the child never really learns to feel confident on the bike. Worth the Money: One of the main reasons why some people do not want to purchase the balance bike is because they feel that it is not economical. The truth is that it can be used as a replacement for a bike with training wheels that may not be too safe for kids. Encourages Kids to Play: Most of the time, kids right now only like to play at home probably because there are a lot of game consoles that are available. Kids can play with the use of their tablets and other gadgets but with this bike, kids will like to go outside and play. This will give them enough exercise throughout the day, at the same time; the experience will be totally different from what they experience at tablets. Can Help Families Bond: There are instances when families do not have enough time for each other because some family members are too busy. Parents just let their children play with their tablets and children do not make the effort to talk with their parents anymore. With the use of the balance bike, people are able to stay together and laugh together. Helps Kids Learn: Riding the bicycle can be hard for some kids and easy for some. With the use of the balance bike, kids can learn faster and easier. Very Safe: They are considered safer than bikes with training wheels and even some bikes for kids. Having a safe bike will allow you to feel secure while your child is learning how to ride a bike for the first time. How old does a child have to be to start riding? A lot of times, children are recommended to start riding at the age of 2 years old. The main reason for this is because it can be easier for children to learn how to ride a bike. Do remember that the younger the child is, the more that you have to guide the child well. How can it help children ride bikes? The great thing about balance bikes is that the child will learn how to balance on his/her own in order to help the progress from a bike to a regular bike far easier to do. Do balance bikes need to be installed with pedals? The main reason why balance bikes do not have pedals yet is because they are only meant to help children balance well. Children feel most of the time like they are gliding or flying when they are using their bikes. Do balance bikes have breaks? The main reason for this is because children might have a hard time balancing and concentrating on brakes at the same time. Will it be easier for kids to stop the bike? In order to do this effectively, a child must be able to reach the floor properly. Even while sitting down, the child must be able to place both of his/her feet on the ground so that whenever the balance bike would need to be stopped, it can be stopped easily. Make sure that the instructions will be followed when it comes to assembling the parts of the bike so that nothing will go wrong in the process. If it came with wrappings, dispose of those wrappings immediately so that they will not be hazardous for your child. It is always better if the bike will be used in a smooth and flat surface all the time. Not only will this help keep the bike in good working condition, it can also help keep the child safe from harm. The bike should be adjusted based on the size of the child who is going to use the bike. Not having the right adjustments can cause some problems. The right equipment and gear should be worn while using the balance bike. Keep the Bike Clean: No matter what type of material the balance bike is made out of, you have to make sure that you will clean it often. This will also help your child not to develop any allergies in case the bike becomes too dirty. Store the Bike in A Safe Place: If you would just leave it lying around, there is a possibility that it will become more susceptible to outside forces that will make it break down easier. Make Sure to Check the Various Parts of the Bike: Checking the bike parts will ensure that it will always be safe to use by your child. Use the Right Tools: This is an important thing to do especially when you are going to adjust the seat or the handlebars of the bike. If you do not use the right tools, this might make the car break down. Adjust: Do not be afraid of adjusting because even if you have already adjusted previously, there is always a chance that you would need to readjust it yet again.